A large amount of research has been conducted on play and in recent years the disappearance of play has been questioned (e.g., Brown in Kindergartners get little time to play. Why does it matter? 2016; Ebbeck and Waniganayake in Play in early childhood education: learning in diverse contexts, Oxford University Press, South Melbourne, 2016). 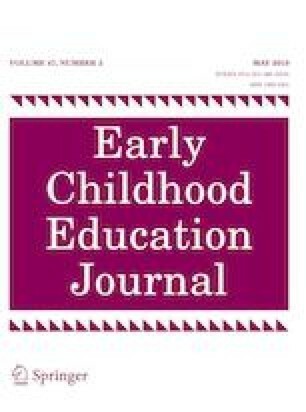 Researchers and practitioners alike have expressed serious concerns that academic pressures on the curriculum have reduced the amount of time given over to play (Nicolopoulou in Hum Dev 53:1–4, 2010). This paper raises some important issues in relation to outdoor play and presents a research study conducted in Singapore—a highly urbanised country. The research examined early childhood teachers’ views on the value of outdoor play and their teaching practices in outdoor play with young children. Findings showed that most teachers enjoyed conducting outdoor activities; however, they were concerned about the lack of physical and human resources. At a follow up sharing of the research results, teachers were able to suggest some ideas to cope with the challenges identified in the study findings. Implications are drawn for practitioners, education policymakers, and for town planners working in urbanised countries like Singapore. Brown, C. P. (2016). Kindergartners get little time to play. Why does it matter? Retrieved March 31, 2018, from https://theconversation.com/kindergartners-get-little-time-to-play-why-does-it-matter-57093. Department for Children, Schools and Families. (2008). Statutory framework for the early years foundation stage: Setting the standards for learning, development and care for children from birth to five. Retrieved August 28, 2018, from https://grenfellactiongroup.files.wordpress.com/2015/09/statutoryframework.pdf. Department of Education Employment and Workplace Relations (DEEWR). (2009). Belonging, being & becoming: The early years learning framework for Australia. Retrieved March 20, 2017, from https://docs.education.gov.au/system/files/doc/other/belonging_being_and_becoming_the_early_years_learning_framework_for_australia.pdf. Department of Foreign Affairs and Trade. (2018). Singapore: Health risks. Retrieved December 2, 2018, from https://smartraveller.gov.au/Countries/asia/south-east/Pages/singapore.aspx. Department of Statistics. (2018). Population & land area. Retrieved March 31, 2018, from https://www.singstat.gov.sg/statistics/latest-data#16. Early Childhood Development Agency. (2006). Guidelines for centre-based infant/toddler care services. Retrieved March 31, 2018, from https://www.ecda.gov.sg/documents/ccls/Infant_Care_Guidelines.pdf. Early Childhood Development Agency. (2013). Early years development framework for child care centres. Retrieved April 1, 2018, from https://www.ecda.gov.sg/growatbeanstalk/Documents/EYDF%20eng_secured.pdf. Early Childhood Development Agency. (2015). Guide to setting up a child care centre. Retrieved March 31, 2018, from https://www.ecda.gov.sg/Documents/Resources/CCC_Guide.pdf. Early Childhood Development Agency. (2017). Statistics on child care centres statistics and reports. Retrieved March 31, 2018, from https://www.ecda.gov.sg/Documents/Resources/Statistics_on_child_care(STENT).pdf. Grigg, A. (2014). The wonder years: Inside China’s ‘cram schools’. Retrieved December 20, 2015, from http://www.afr.com/lifestyle/arts-and-entertainment/art/the-wonder-years-inside-chinas-cram-schools-20140307-ixmf3. Lai, L. (2017). Singapore acts to nip problem in the bud. Retrieved April 1, 2018, from http://www.straitstimes.com/singapore/singapore-acts-to-nip-problem-in-the-bud. Ministry of Education (2012). Nurturing early learners: A framework for a kindergarten curriculum in Singapore. Retrieved April 1, 2018, from https://www.nel.sg/nel/slot/u566/Resources/Downloadable/pdf/kindergarten-curriculum-framework.pdf. NatCen Social Research, UCL. (2017). Health survey for England 2016: Children’s health. Retrieved December 13, 2018, from http://healthsurvey.hscic.gov.uk/media/63769/HSE2016-Child-health.pdf. National Environment Agency (2018). Dengue cases. Retrieved December 1, 2018, from https://www.nea.gov.sg/dengue-zika/dengue/dengue-cases. NurtureSG Taskforce. (2017). NurtureSG: Action plan report. Retrieved March 31, 2018, from https://www.hpb.gov.sg/docs/default-source/default-document-library/nurturesg-action-plan-report.pdf?sfvrsn=460f572_0. Sandhu, B. (2017). Protect your child against diabetes. Retrieved April 1, 2018, from http://www.todayonline.com/lifestyle/your-child-risk-diabetes. Society of Health and Physical Educators (SHAPE). (2015). Position statement: Comprehensive school physical activity programs: Helping all students log 60 minutes of physical activity each day. Retrieved December 1, 2018, from https://www.shapeamerica.org/advocacy/positionstatements/pa/upload/Comprehensive-School-Physical-Activity-Programs-Helping-All-Students-Log-60-Minutes-of-Physical-Activity-Eeach-Day.pdf. Tan, S., & Hamzah, A. (2018). Singapore a good country to raise kids, but maybe not the best. Retrieved December 2, 2018, from https://www.savethechildren.org/content/dam/usa/reports/emergency-response/end-of-childhood-report.PDF. The Department of Health (2017). Australian 24-hour movement guidelines for the early years (birth to 5 years): An integration of physical activity, sedentary behaviour, and sleep. Retrieved June 4, 2018, from http://www.health.gov.au/internet/main/publishing.nsf/content/npra-0-5yrs-brochure. United Nations Department of Economic and Social Affairs (Population Division). (2014). World urbanization prospects. Retrieved December 20, 2015, from http://esa.un.org/unpd/wup/Highlights/WUP2014-Highlights.pdf. World Health Organisation. (2010). Urbanization and health. Retrieved December 20, 2015, from http://www.who.int/bulletin/volumes/88/4/10-010410.pdf. World Health Organisation. (2018). Physical activity. Retrieved December 1, 2018, from https://www.who.int/news-room/fact-sheets/detail/physical-activity.